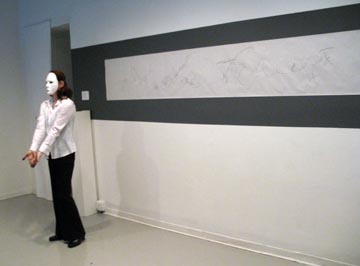 19 March 2007 Performance with bodily vocalization. Charcoal on 18"x140" rice paper. My performance Writing and/or Speaking explores grammatology in performative, literary art in new media in conjunction with manually speaking or sign language. This performance defies the concept of logocentric hierarchy and dichotomy between writing and speaking. 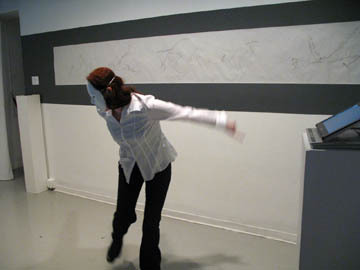 This performance demonstrates multi-layered levels of Derridean arche-writing in performative poetry. 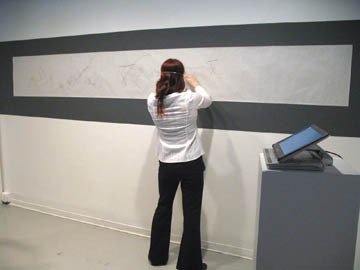 It displays the complementarity of speaking and writing and the simultaneity of the body as paper and ink. Related art: ASL, Coughing English, ASL.